As a manager, having a strong understanding of various soft skills is necessary to lead your team. Doing a little self-assessment can help illuminate areas where improving your skills can greatly improve the performance of your team, along with your own personal success. It’ll also show you which soft skills you’re strong in, so you can better understand how to teach those positive behaviors to others. While reading through the statements in this assessment, make sure to look at it objectively – thinking about how you truly think and act, rather than how you would like to. 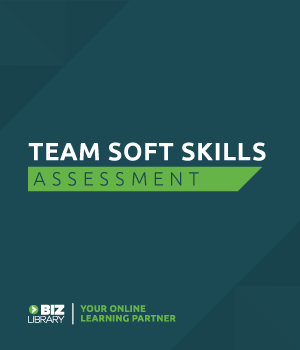 After completing the assessment and seeing your own results, make sure to download the workbook to assess your team’s soft skills as well! I create positive outcomes from accepting my emotions. When making a decision, I seek others' perspectives to view it from multiple angles. I keep myself from jumping into a conversation while others are speaking. The goals I set have clear expectations and standards for how to achieve them. When creating goals, I look at the goals of others in my organization or family to see how they align. When others are debating something, I can understand the viewpoints of all sides, whether or not I agree with them. If someone starts speaking to me while I'm working on something, I pause what I'm doing and give that person my full attention. I research information to help support my case when proposing an idea or solution. I'm able to connect with people easily – they listen to what I have to say. My colleagues and managers see me follow through on my word. I anticipate and plan for problems that could occur when going through major changes. When approaching a problem, I ask "What else could be the problem?" to help identify the root cause. I find ways to compromise so everyone involved in a conflict is satisfied with the solution. I offer to help colleagues with their work when they need it. When I'm struggling with a problem, I ask others for help. I objectively weigh the costs and benefits of each possible solution when making a decision. To keep myself accountable, I share my goals with others. I can make sense out of ambiguous and complex problems. I don't let the impulse of the moment make decisions for me. I calm myself down before responding to an emotional situation. When I'm involved in a conflict, it's resolved quickly and fairly. When I tell others about changes, I ask what they think. I repeat points back during a conversation to ensure I understand what the other person is saying. When faced with making a decision, I see both the logic and the emotions involved. When I come up with a solution to a problem, I think through any new problems that solution could create before implementing it. I seek out feedback and constructive criticism. I follow up on my solutions to problems to see if the effects were positive. When making changes to something, I come up with well-reasoned explanations to address others' concerns. I look for multiple perspectives when determining what caused a problem. I'm curious about what else I can learn. When arguments become heated, I quickly de-escalate myself and others. I plan ahead so I know what I'll be working on the next day. I hit deadlines and keep my commitments. I define the importance and the urgency of tasks in order to prioritize them. I'm able to communicate why changes are happening so that others get on board with those changes. I don't ignore difficult conversations. I balance logic and emotion to explain my viewpoints to others. I internally recognize and accept my emotions as they come. I take time to analyze why I feel the way I do about different situations. I look for more efficient ways to do things. I try to understand widely diverse perspectives, ideas, and experiences. I'm comfortable with adapting to new situations. I allow myself to feel emotions fully, rather than suppressing them. I create goals for personal and professional growth. I put time into doing the things that are most valuable to me. I use my past experiences to help me in new and unfamiliar situations. After I set a goal, I create a plan with milestones to show my progress toward the goal. When conversing with someone, I can accurately read their body language. After someone speaks to me, I think of open-ended questions to ask them. Before making decisions, I think through both expected and unexpected outcomes. Learn practical ways to improve your soft skills with these free guides! All of these soft skills can be learned and continually improved upon. These guides will help you understand the kinds of behaviors that support each skill, so you can turn that insight into positive action. Ready to improve your soft skills? How about doing the same for your team? The Team Soft Skills Assessment can be used to see where individuals on your team are strongest, and where they can improve most. This workbook, along with each of the guides, will give you and your team a solid awareness of how soft skills are impacting your work, and provide steps to cultivate expertise in each area. Complete the form below to access the team assessment and all of the guides! We just need a little info first.